SPACE Architecture + Design | Look Ma! We won another AIA Award! Home » Design » Look Ma! 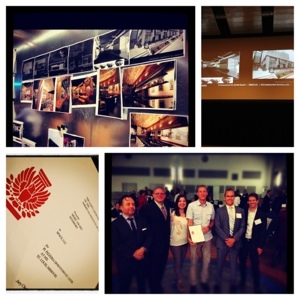 We won another AIA Award! Look Ma! We won another AIA Award! Yep, all of our moms are proud tonight because we brought home another American Institute of Architects Award, this time an Award of Merit for our design of the brand-new Pi Pizzeria at the Mercantile Exchange Building (the “MX”) downtown St. Louis. As beautiful as the restaurant turned out, SPACE can’t take all the credit — the folks at Pi gave Project Architect Kyle Nottmeier and Interior Designer Elizabeth Cockrell the creative freedom to produce an interior that captures Pi’s hip, local style and the chic elegance of the Mercantile Exchange. By pairing rustic, natural materials with the honest simplicity of steel and glass, the crew at SPACE created a sophisticated yet comfortable place to nosh on some of St. Louis’ best pizza. The AIA Awards are some of the most prestigious in the field of architecture, and we’ve been fortunate to have earned a total of five: Franco, Imagine Schools, Bobo Noodlehouse, Chill and now, Pi. We love what we do, and we appreciate the nod from the local architecture community.